Wipaq provides its customers with the state of the art products such as the ht400 which is a twin turnstile. This can be installed individually or in combination within the area for safe keeping of the premises. The body is quite sturdy and works efficiently as well. 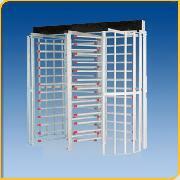 The HT 400 Series Full Height Twin Turnstile may be ordered in a variety of different configurations. Please call for details.